GM has started production of its two new bi-fuel options in the pickup truck market. 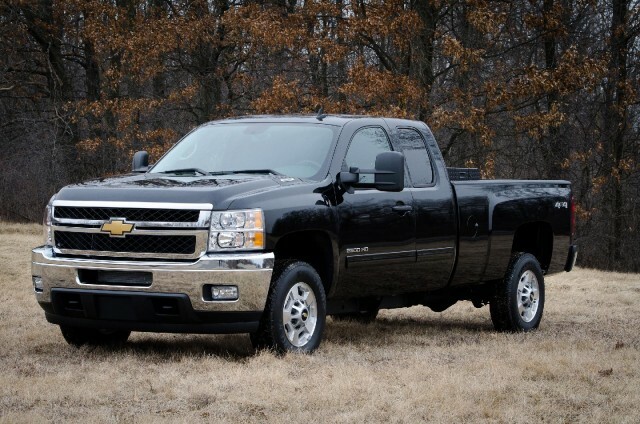 The 2013 Chevrolet Silverado HD and 2013 GMC Sierra 2500 HD bi-fuel models are able to run on either regular gasoline, or compressed natural gas (CNG). A 6.0-liter V-8 as found under the hood of each truck isn't your typical green engine, but allows each truck a range of 650 miles when both gas and CNG tanks are full. CNG is also cheaper for buyers, and offers lower carbon dioxide emissions than when running on gasoline. It also produces much lower carbon monoxide emissions, and lower oxides of nitrogen--making it the cleaner option. GM says that the bi-fuel options don't compromise on performance, but they do cost a little more than the regular truck--$11,000 extra on each model, covering the cost of the conversion. The Silverado costs from $41,590 after the conversion, and the Sierra starts at $40,100 post-conversion. That will increase payback time for businesses, but with CNG costing an average of $2.15 per gallon at the moment--or as low as $0.81 at one station in Indianapolis--it could prove to be a shrewd move for some operators. GM predicts that customers could save between $5,000 and $10,000 over a three-year period, depending on driving habits--and that's before green-conscious businesses consider the environmental benefits. Both trucks are covered by GM's 3-year, 36,000-mile new vehicle warranty and 100,000-mile powertrain and emissions warranty, for added peace of mind. Ram Pickup Trucks To Get Natural-Gas Option For V-8 Engines?